History and heritage along with energy and excitement come together on the Country Music Highway at the Highlands Museum & Discovery Center. From 6 months to 96 years old, visitors find activity and information that puts the past in perspective and moves the present into the future. During your visit you’ll step into a nineteenth century classroom and become a student of the 1870’s. Enter a medical world when late night house calls were made on horseback and payment was in chickens. Immerse yourself in the culture of Eastern Kentucky music and visit the Cyrus and Judd families. Create your own music on our Karaoke Korner stage or at Music Quilt, an interactive sound sculpture. Salute those who served during the wars of the twentieth century and see Hitler’s last telephone. The Discovery Center boasts many areas of interactive exploration, including a special play place for toddlers and a flight simulation station for pilots of all ages. Walk into the Ohio River town of Poage’s Landing and navigate Little Joe, an actual towboat. Role play in the streetscape of a river community. Learn about the natural world around you in the tree house exhibit or rest awhile on the front porch and enjoy games, a puzzle garden and a puppet dog house. The Kentucky Highlands Museum was organized in 1984 as a historical and cultural center for the Ashland, Kentucky area. The Museum was housed in the historical Mayo Mansion until taking up residency in downtown Ashland’s Main Street District in the first floor, basement, and mezzanine levels of the former C. H. Parsons Department Store in 1994. 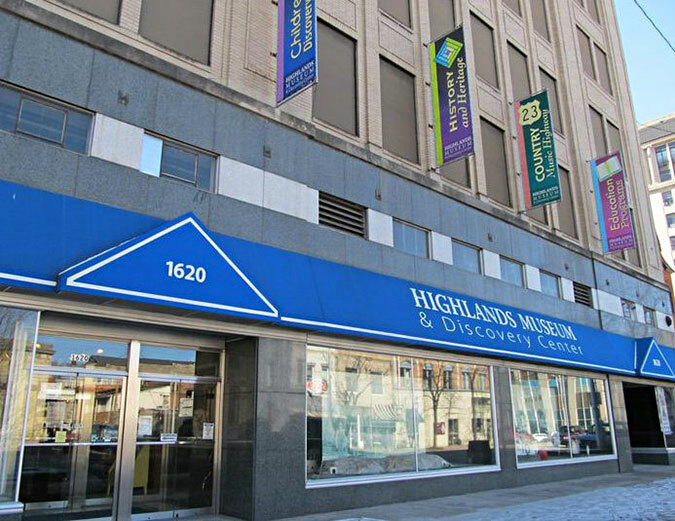 In 1997, the museum, following a strategic planning process, changed its name to the Highlands Museum & Discovery Center with the above mission statement. On November 15, 2013, the Museum purchased the Parsons building from its landlord. The purchase, termed “A New Beginning,” represents a milestone in the Museum’s history because it opens opportunities for additional improvements and expansion into other floors of the building. Our partnership with Morehead State University in 2014 allowed us to create a Space Science Center displaying satellites, CubeSats and showcase the Space Program at MSU. The museum completed an extensive renovation of the lower level bathrooms, doors and the elevator in 2017 with the assistance of CDBG grant matched by the Woodlands Foundation that ensures the museum is ADA compliant. The newly renovated 4th floor, the Highlands Center, is the largest conference center in the city of Ashland. It is available for large conference, reunions, and receptions accommodating up to 500 people. Plans are underway to make an all-new Discovery Center become a reality for the children of Ashland and the surrounding area.